On Friday I decided I needed something better than just my hands and voice to teach about subduction zones. Every Earth science teacher and researcher will use their hands to represent the plates. But my guess is that most people don’t really have a sense of what tectonic plates are. By using our hands we may not really be helping them understand. We may just be confusing them more. A quick explanation of a tectonic plate. The upper layer of earth is divided into 13-17 plates (scientists don’t always agree what defines the boundary of a plate). The whole surface or outer layer of Earth is covered by tectonic plates. Below the plate layer, there are layers of rocks that behave differently and may be made of very different stuff. The interesting action at the surface is at the plate boundaries. The plates are moving, growing and shrinking. Plates move about as fast (or slow) as your finger nails grow. Made with office supplies found in the storage closets, the model is pretty simple. Back on shore I would have gone to the foam store, but at sea I had to use what is here. I covered label boxes with white paper. I managed to print a largish map of the region after fighting with the printer and computer for a while. 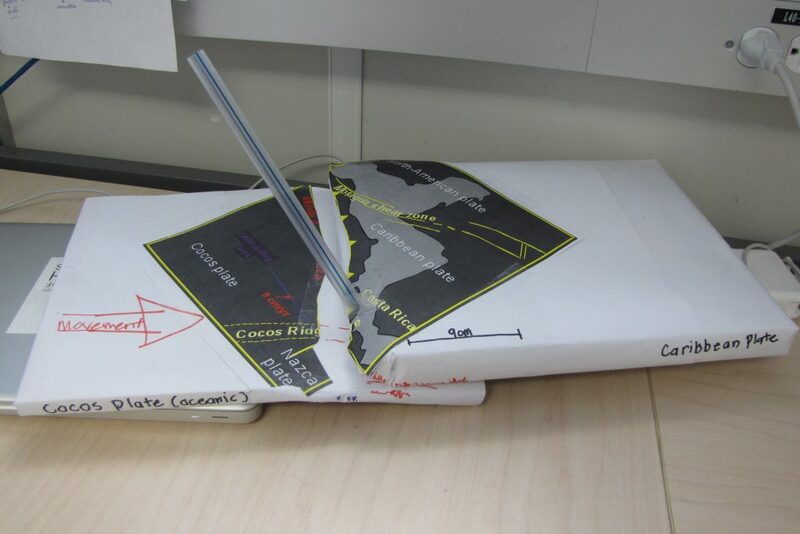 Then I cut my map along the plate boundary and labeled it on the boxes. I found the mini-core case in the art supplies – I guess I’m not the first to want be creative. The scientists were all waiting, but not all so patiently, for the core to arrive on deck when I went up to show off my creation. I got some great suggestions on improving it. With any good teaching tool, we must keep the system simple, yet accurate. I opted not to use a topographic map, although I think it was a good suggestion. I added a few little stars on the subducting plate to show that there are earthquakes that start at depth. The biggest challenge was finding the right material to keep that subducting plate at an angle, not just sliding below the upper plate. I tried it out with a classroom from San Jose, California on my next live broadcast. I think it was more effective than just using my hands.